Cleaning in the catering and hospitality environment has undergone significant change in recent years, evolving from a range of factors, including: the socio-economic climate, technological advancements, and the desire to operate more sustainably. In a series of five ‘Clean and Simple’ blogs we investigate these changes and discuss how foodservice operators might adapt to emerging challenges in cleaning and hygiene. Not so long ago, a mop and bucket and bleach and washing up liquid were the mainstay of keeping a commercial kitchen up to the acceptable standard of cleanliness. 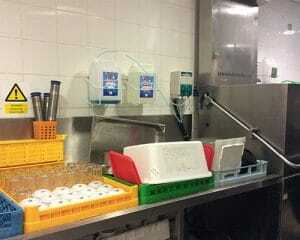 Today however, hygiene standards are stringently audited by local authority environmental health departments under guidance from the Food Standards Agency (FSA). In a bid to stay compliant at all times, catering operators are increasingly turning to innovation and technology to help them maintain tip-top levels of cleanliness in the kitchen and other food preparation areas. This can be evidenced in the adoption of innovative dispensing systems, facilitating the safe and effective dilution of liquid cleaning concentrates on-site. These include devices that dispense washing up liquid into a sink as soon as the tap is turned on – so that bubbles fill the sink immediately, and others that rely on water pressure to produce a ready mixed product. There are also devices installed within bottles of concentrated liquid so that the right amount is released into a small reservoir when you invert the bottle. Concentrated dishwashing and laundry detergents are now often dosed into their machines using electronic pumps. The complexity of some of these electronic pumps is mind boggling – to the extent that some devices can (if you really want to know and under interrogation from a trained operator) tell you if someone crept into the kitchen at 3:45 am, filled the dishwasher and activated it to wash two plates and a spoon! 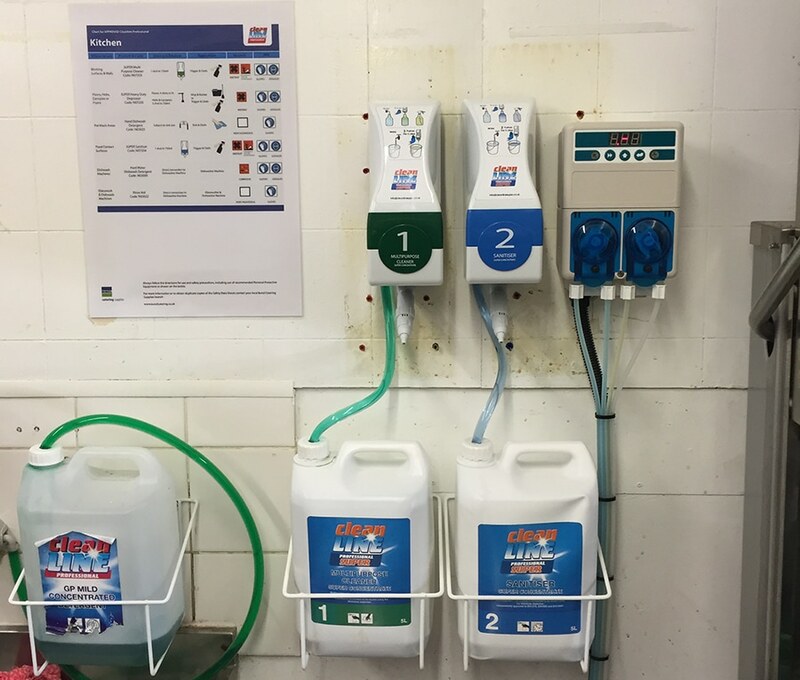 For catering operators trying to decide which dispensers are right for their operation, they should understand that dispensing equipment doesn’t usually come free but is generally added to the price of the cleaning products themselves. So, the more advanced the dispensing system, the more you’re likely to be paying for your cleaning products. The challenge for catering operators is to balance new technology with trusted, functional design – that works and provides good value. As leading suppliers of catering disposables and cleaning and hygiene products in the catering and hospitality sector, Bunzl Catering Supplies delivers and supports a well-respected range of cleaning products to foodservice operators called Cleanline. The Cleanline range includes a number of dispensers, chosen because they are robust, reliable and user-friendly. Like our products, our dispensing equipment and service are simple and functional because we know that you don’t need bells and whistles to produce a good tune. Cleanline is also supported by a 24-hour emergency response service, and also provides COSHH awareness training via a unique online e-learning website. For more information about Cleanline – please contact us today.